It’s exciting enough that a competitive cooking show game got made, but Battle Chef Brigade is actually good. Hunting and cooking your prey to make gourmet dishes is awesome, and the mix of game mechanics pulls it all together. The difficulty in the action portions means you have to work harder to get those really good ingredients, and the match-three cooking perfectly simulates the rush to put together a dish before the time runs out. The characters add a special flavor, with endearing folks like Mina, Thrash, and my personal favorite, Shiv. I’m really hoping this is the start of something for Trinket Studios rather than a one-off meal, because I would love any excuse to play some more Battle Chef Brigade. I didn’t really get the hype behind Battlegrounds at first. It’s just a mod—how different could it be from any other multiplayer game? But then I made the top 10 in a solo match by myself and was in the ruins of Erangel, lying prone behind a few crates and watching the blue circle close in. I could hear footsteps, but I stayed still. Once I opened fire, I wouldn’t be hidden anymore. I needed to make it count. Slipping out along the walls, checking corners and peering around rubble, I thought I saw a slight shuffle in the grass. Bang. I was down. Falling at No. 3, No. 2 had killed me, before dying to No. 1, the last to make a sound and the only survivor. Battlegrounds is a concept so simple and compelling that it’s maddening it took this long to truly make it big. I have dropped onto dozens of islands and will continue doing so for a while. I am still hungry for the chicken dinner I came so close to tasting. Persona 5 continues the series’ trend of combining grand tales of demons and mysteries with excellent character writing. It’s also probably the longest game I played this year. Little improvements helped the game feel a lot more focused than previous Personas, although there were still a few dungeons that went a hair long. The cast, the music, and the aesthetic are simply phenomenal, and every day I was eager to see who was available to hang out and what the characters might go do. What I remember most clearly is the little interactions, not the main plot: the maligned shogi player, the frazzled teacher, the discredited doctor, and a girl who learned to be confident and summon a damn motorcycle. 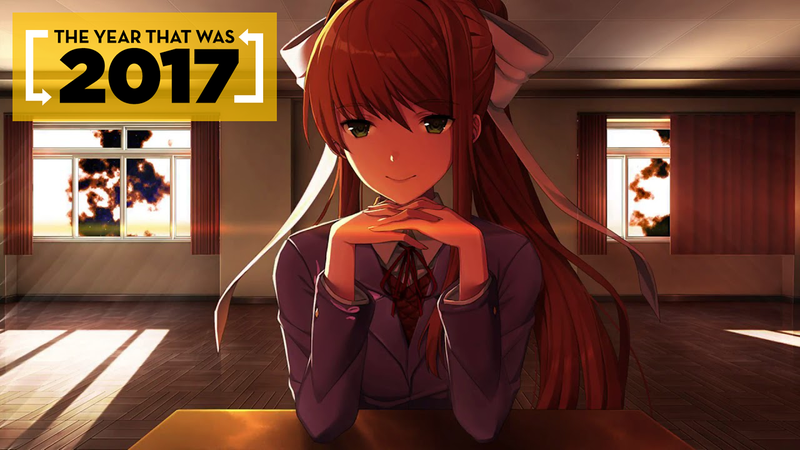 This was the biggest surprise of the year: a small, seemingly innocent visual novel that goes through twists and turns, toying with your expectations until the very end. The game does an incredible work from a technical perspective, using the Ren’py engine to mess with its audience and disarm them. But plenty of games break the fourth wall now. It’s how Doki Doki Literature Club does so, and to what ends, that makes it so special. The story subverts its own genre, hitting themes of agency, control, and unrequited love. It’s really hard to chat more without spoiling its best parts, but this game is free, short, runs on any piece of hardware, and worth every minute spent playing it. Of all the multiplayer games I played this year, Splatoon 2 was the most unique. Where PUBG feels like the ur-game, Splatoon 2 is the game that changes up its genre. It’s a shooter that visually displays area control. You win by not just owning the other team, but the land around them. Splatoon 1 created the concept, but Splatoon 2 refined the hell out of it. Inkbrellas! Ink zorbs! Splatoon already feels like a Nintendo franchise in the good way, the same way folks talk about Mario and Zelda. Splatoon 2 is the multiplayer game I can play with my dad, and that’s more than enough reason to have it on my list. It took me a while to grapple with Edith Finch, which is a very somber game. In some respects it feels rushed and unfinished, but each vignette—the cannery, the comic, the consuming monster—sticks with you. They’re each a portal into one life throughout generations of Finch family. What Remains of Edith Finch is a game about loss and what comes after. In each vignette, you’re seeing someone’s life contained in a moment. There’s an aching beauty to that simplification, one that has resonated with me this year especially, and so I can overlook Edith Finch’s shortcomings for the catharsis it gave me. Only a series of screenshots can do full justice for this incredibly wacky adventure of a game. Yakuza 0 was my introduction to the series, and I got hooked quickly. The Japan of Yakuza 0 is alive and vibrant with motorcycles, bowling alleys, cabaret clubs, and Mr. Shakedown himself. Yakuza 0 is just fun. Every side activity is as long or short as you’d like it to be. Want to spend a few minutes playing pool? Go ahead. Want to learn to play shogi over the course of hours and hours? Do it. Then you go back to the main plot, and delve into the world of intrigue, double-crossing, and most importantly dudes taking their shirts off to show their back tattoos. That’s the moment you know a fight is about to get really, really serious. Also, Majima Goro might be my favorite protagonist of the year. That ending ruined me. Breath of the Wild is lonely. There were multiple times where I would look around from the top of a mountain or in the middle of plains and see for miles. Link was waking up years after he had failed to stop evil and save his friends and seeing the repercussions: ruined walls and turrets, destroyed villages, and swords littering a battlefield. Breath of the Wild gives you a small set of tools, rather than a bevy of gadgets with their own bespoke dungeon, and tells you to just go explore and discover. Think you can kill Ganon right now? Do it. I walked away from Breath of the Wild feeling like I was free to carve my own journey in it; I could decide when I truly felt like the hero Link was meant to become. Danganonpa V3 has one of my favorite endings in video games, ever. The entire game is subverts expectations and creates a commentary on the series’ overarching conflict between hope and despair. There is an irreverence for the canon that I adore in V3. It is, in structure, a Danganronpa game. You live trapped in a school, you discover murders and then hold a trial, and Monokuma presides over all of it. But in the last two cases, V3 turns the idea on its head. It questions the worth of blind attachment to a fictional liturgy, instead opting to make its own way. I love it. Burn your sacred texts. Also, the Debate Scrum is easily the best mini-game in Danganronpa history. I love so much of what this game does. It has a simple but excellent combat system and a gorgeous aesthetic. The worldbuilding is incredible, as each little detail informs you on the endless conflict between androids and machines. Keiichi Okabe’s score is fantastic. The story of 2B, 9S, and A2 is heartbreaking and beautifully told, in a way that only a game could pull off. Nier: Automata contains some of my favorite moments this year, and in any game, any year: ending E. Hacking certain foes, the opera singing boss, Pascal. Nier tries to explore the human condition through simulacra crafted to carry on their legacy and repeat it, failing over and over, as immortal theater. It’s one of the best games I’ve ever played, and certainly my favorite game of the year.